For most of us Faro is just the entry point for our Algarve holiday. We arrive at the airport, get the hire car, turn left and go down the coast. But Faro has plenty of interesting sights, and in this guide we reveal the best things to do in Faro so why not turn right this time and give it a well deserved visit.. This is stuffed full of Moorish and 17th century Portuguese architecture including the grand old Faro Castle and warrens of cobbled streets that eventually lead down to the old harbour. The old town consists of three very distinctive areas – Vila-Adentro, Mouraria and Bairro Ribeirinho and you can wander the streets crammed with cafes and restaurants and just sit and sip a cold Sagres beer or a strong bica of espresso and soak up all the atmosphere. Keep an eye out too for the storks circling around their nests high up in the rooftops. This a macabre spectacle where the grisly skeletons of 1,200 monks decorate the Igreja do Carmo Church within the Manuel Bivar Gardens. The ultimate way to recycle don’t you think? Make sure you also spend a few hours on the deserted island lying just off the coast called Ilhas Deserta. Nothing there except soft sandy beaches and a wonderful (mainly fish) restaurant called Estamine. A ferry boat regularly cruises across so check out the sailing times. The Algarvian coastline is the perfect habitat for golf, so it’s no surprise some of the 35 courses along its rugged edge are the finest in the world. 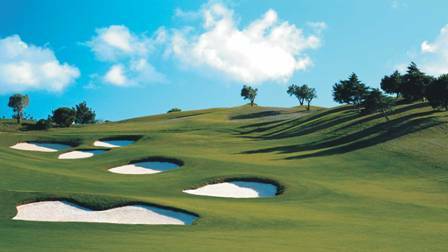 Just a short drive from Faro you’ll find Almancil’s two stunning golf resorts. The Quinta do Lago Estate with its Augusta type courses have hosted the Portuguese Open no less than eight times and right next door is home to the most famous par 3 in the world and the magnificent San Lorenzo course, its fairways running right alongside the Ria Formosa nature reserve. The Portuguese need very little encouragement to have a party, consequently, Faro is never short of a festival or two, from the Fiera da Santa Iria the biggest – which takes over the town every October, to the plain quirky like the Rallye Biker one of Europe’s biggest biker meets at the end of June with rock music and a parade of motorbikes through the streets. Rest assured, whatever time of the year you’re here there will be something to celebrate! 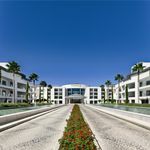 Faro’s two four star hotels both overlook the harbour and you’ll be hard pressed to choose between them. Hotel Eva (Avenida da Republica 1 +351 289 001 000 www.tdhotels.pt/eva) is right next to the marina and just a five minute stroll to the old town. The roof top swimming pool provides a great view of the Ria Formosa reserve too. Hotel Faro (Praca Don Francisco Gomes 2 +351 2899 830 830 www.hotelfaro.pt ) The panoramic rooftop bar and restaurant never fails to offer a terrific view of the old harbour and the food is highly recommended, traditional Portuguese dishes with a twist. The best thing is you get a free shuttle to the Ihas Desertas, between July and September. With the Altantic Ocean on the doorstep, fresh seafood is abundant here, particularly clams, squid, tuna and sardines and well over 100 different varieties of bacalhau, a form of dried cod fish. You’ll also not be far away from some spicy chicken piri piri. Let’s also not forget the delightful Pasteis de Nata, those little egg custard tarts that began in Lisbon’s Belem but have gone on to become Portugal’s much loved national dish. 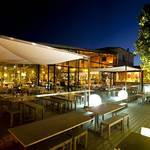 Mesa do Mouro (Largo da Se 10) is a local restaurant tucked away next to the cathedral in amongst the scented orange trees and olive groves. Take an outside table and let the old town come to life around you while feasting on Cataplana or the succulent steaks. Faro e Benfica Restaurante (Doca de Faro, Tel: +351 289 821422) If seafood is your thing, then this lovely restaurant right in the Marina will be perfect. Candle lit tables on a plant filled terrace – very romantic! Don’t expect the locals to come out much before 10pm but when they do, they’ll head for the bars along Rua Conselheiro Bivar such as the Upa Upa Café & Bar or O Conselheiro , and Rua do Prior near the harbour with the Chessenta Bar or you can try out some live jazz in the El Faro Lighthouse Bar. Vinho verde is a Portugeuse wine speciality, coming in bizarrely red or white varieties as the name relates to the youth of the grape rather than the colour! It goes without saying that port should be on the list and let’s not forget a glass or two of Mateus Rose. 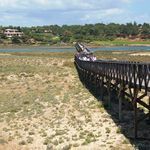 By now you have no doubt realised just how underrated Faro is, so next time you plan a trip to the Algarve, take our Best things to do in Faro guide with you and enjoy the ride!